1. A new interim government was formed. Yes, President Morsi was forcibly deposed by the military and held in an unknown location away from his family. And yes, Muslim Brotherhood members were subsequently charged and arrested and, yes, their assets were frozen. And yes, the general behind most of it really, really likes his sunglasses. It walked like a coup, and it talked like a coup, but the U.S. remained adamant it wasn't a coup. In spite of this, the situation seemed positive. The new interim cabinet was an interesting roundup of 33 intellectuals and technocrats (hell, a Nobel Laureate was even thrown in there) and so the hope was that things would go a little differently this time. And let's not forget Interim President Adli Mansour's awesome (if fleeting) Wikipedia page. 2. The Muslim Brotherhood rejected Mansour's hastily-made timetable. So this was Mansour's plan: a review of the Islamist-drafted (and suspended) constitution within four months, parliamentary elections in early 2014, and presidential elections following immediately after. The whole interim government could've been over in a year. He hoped. But the decree was issued in a hurry — only a few days after 51 people were killed and over 400 people were injured in shootings in the capital — and people were already skeptical: ‘'It was drawn up by an anonymous committee; it was issued by executive fiat; the timetable is rushed; the provisions for consultation are vague; and it promises inclusiveness but gives no clear procedural guidelines for it,'’ an expert from George Washington University told Reuters. Worse, the Muslim Brotherhood rejected it outright, calling it "illegitimate," which "brings the country back to square one." They instead demanded that their democratically elected president be freed and reinstated. 3. 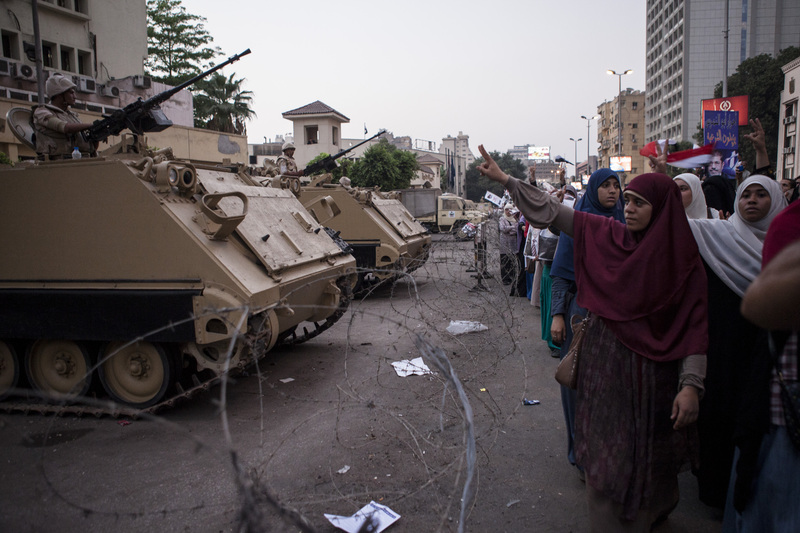 The military opened fire at pro-Morsi protestors — at least 80 were killed. Tensions continued to escalate between those who were in favor of the new interim government, and those who supported the ousted President and the Muslim Brotherhood. Violence broke out, not only in the capital, but across the country. Thousands of pro-Morsi demonstrators camped out in front of Cairo's Al-Rabaa mosque (where Morsi was believed to be held) for weeks on end, demanding his return. On July 27th, the situation spiked. A few days after a bomb went off in the northern region of Mansoura, killing one and injuring over 20 others, Military General Abdel-Fattah el-Sissi — who instigated President Mohammed Morsi's ouster — called on Egyptians to march in support of the army's campaign against "violence." The Muslim Brotherhood took this move to mean "a call to civil war." The resulting opposing demonstrations led to at least 80 (Al Jazeera has the number closer to 120) Muslim Brotherhood supporters being killed, and hundreds more were injured, after the military fired at demonstrators with rounds of alleged live ammunition. 4. Attempts were (sort of) made by The U.S. to resolve the tensions between the Muslim Brotherhood and the interim leaders. They failed. Senators John McCain and Lindsey Graham flew in to Egypt just as things began to look a little more hopeful: in spite of continued protests and violence, a military source was suggesting that the interim leaders were considering freeing a few Muslim Brotherhood members from prison, and might even give the party a couple of ministerial posts. But the efforts broke down pretty quickly, and not in small part due to McCain's having used the c-word: coup. For interim leaders it was offensive, and for Muslim Brotherhood members it was too little, too late. Whatever talk there almost-was fizzled out pretty quickly. "These efforts did not achieve the success that was hoped for, despite full support provided by the Egyptian government," interim President Adly Mansour's office said of the visit. "The state of Egypt appreciates the efforts of friendly nations and understands the reasons why they did not achieve their desired objectives, and holds the Muslim Brotherhood full responsibility for the failure of these efforts." 5. The military has cracked down on Muslim Brotherhood demonstrators, with over 525 killed, and a national state of emergency is declared. Far from having quelled pro-Morsi sentiments, the events of July 27 only served to strengthen the Muslim Brotherhood's resolve. Thousands continued the vigil outside the al-Rabaa mosque, as the military warned them that their days of pro-Morsi protests were numbered. And they were true to their word.Early this Wednesday, Egyptian forces stormed in with armored bulldozers in an attempt to disperse the demonstrators. Twelve hours of tear gas, bulldozers and bullets were shot into the crowd. The events left an estimated 638 people dead, most of them civilians. An estimated 4,000 people are injured.In response, the interim government declared a month-long state of emergency, and interim Vice President Mohamed ElBaradei has now resigned. 6. So where does this leave Egypt now? In a depressingly familiar situation: with the military holding a lot of power. The Muslim Brotherhood has vowed a military coup. Egypt’s last month-long state of emergency was declared as recently as last January; when ex- President Mohamed Morsi gave the police the power to arrest and detain whomever they wanted in the cities of Port Said, Suez, and Ismailia. According to NPR's international correspondent, now, under the emergency law, the Egyptian military "could more easily clamp down [...] without having to legally answer for it."